Elcir is a leading company that can manufacture and deliver Stainless Steel and Aluminum works along with its proprietary Woodworks. Its workshop facilities includes equipment necessary for the manufacturing of a very wide range of works that compliment Elcir traditional products, in order to offer clients a global solution. 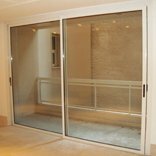 Such products include but are not limited to Aluminium Windows, Curtain walls, Glazed Partitions, Skylights, Aluminium or Stainless Steel Railings, Wrought Iron works, Bronze or Stainless steel Cladding... Aluminium windows are manufactured using Technal or other European profiles, with a 5 year warranty for lacquering of profiles. Special computerized machinery is also used for bending metallic profiles.